← DGRS SELLS OUT; RETIREES, BARROW SAY ‘VOTE NO’ ON DETROIT BANKRUPTCY PLAN! Rev. 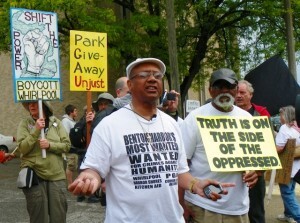 Edward Pinkney speaks against Whirlpool takeover of Benton Harbor May 26, 2012. BENTON HARBOR — You probably noticed in the June, 2014, edition of the People’s Tribune the articles about the attack on leaders and the movement in Benton Harbor, Michigan. A trial date for Rev. Edward Pinkney, charged with trumped up vote fraud charges related to an effort to recall a Whirlpool-allied mayor, James Hightower, is July 21, 2014. In light of this date and the dangerous political climate in Benton Harbor and Michigan as a whole, breaking the media blackout and broadening the outrage against the attack on this leader are urgent. 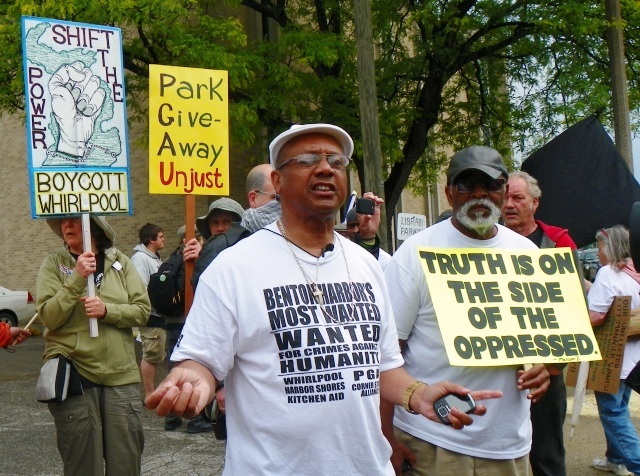 Truth be told, the charges leveled against Reverend Edward Pinkney are but the latest saga in a ruthless pursuit of naked corporate rule that is gripping the state of Michigan. Rev. Pinkney (r) speaks at first mass rally against Emergency Manager Law Public Act 4, later repealed and replaced with PA 436. 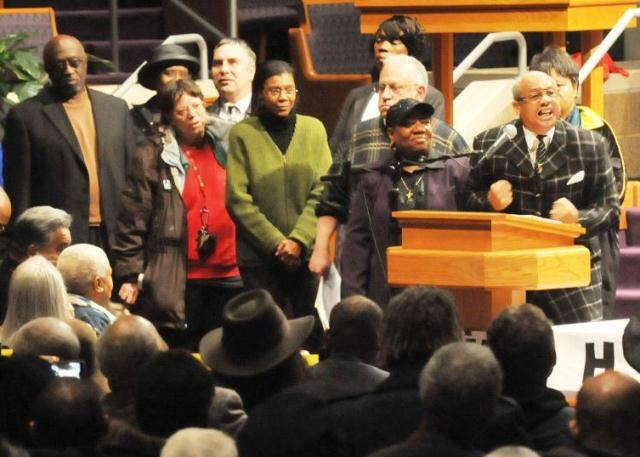 Rally of thousands was held at New Triumph Baptist Church in Detroit. In 2011, current Governor Rick Snyder signed into law legislation that codified the fascist offensive already in motion. The law, a.k.a., Emergency Manager law, dispatches unelected ‘managers’ to designated cities and school districts and issues ‘edicts’ that fast track the sale of precious public assets to bondholders, banks or other corporate interests, privatizes public services, dismantles collective bargaining agreements, and more. They are empowered to even dissolve municipalities and school districts, all the while replacing local elected officials altogether. Benton Harbor, home of corporate giant Whirlpool, is a poster child of the Rust Belt’s post-industrial destruction of the manufacturing life we once knew. Benton Harbor is 90% African American and 42.6% of the population lives in poverty. 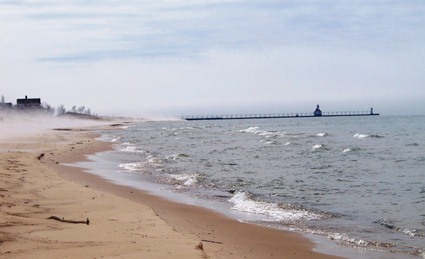 Benton Harbor’s beautiful beach on Lake Michigan, located at Jean Klock Park, now surrounded by luxury condos and a world-class golf course. With its rich Lake Michigan beachfront property park, (which has now been stolen from the people,) Benton Harbor was one of the first to experience the wrath of Emergency Managers. Now more than 17 municipalities and school districts, including Detroit, have been pulled into the mire of dictatorship. Reverend Pinkney has become the face of resistance – resistance to the notion that the working class has no rights that the corporation is bound to respect. Any and all efforts must be made to overturn the charges against Pinkney as a step toward overturning the spread of this model to the rest of Michigan and the nation. Rev. 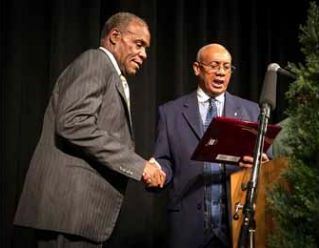 Pinkney reads award to actor Danny Glover at fund-raising dinner last October. In closing, we would like to give you a brief update of the case. The State is determined to get Rev. Pinkney. Because they don’t have solid evidence, they say that in the State of Michigan circumstantial evidence is enough to convict. The prosecutor also mentioned that he wanted to use the habitual offender law which could mean, if convicted, that Pinkney could be put away for 15-20 years. A further disadvantage is that it takes 30 days to get the transcript. The State’s plan is to limit the amount of time that the lawyers have to prepare for the trial. People in Michigan and throughout the country are not letting this fascist assault on our leaders and communities go unanswered. 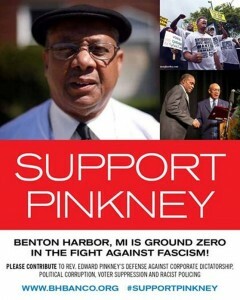 People are rallying to Pinkney’s defense. In addition, the Benton Harbor community is considering launching another recall drive to get the Whirlpool-allied mayor James Hightower out of office. 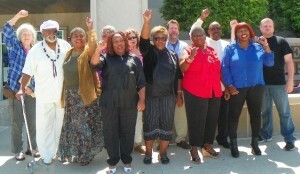 People from across the state supported Rev. Pinkney at his preliminary exam May 31, 2014. His wife Dorothy Pinkney is 4th from left. Such activity will be very important. 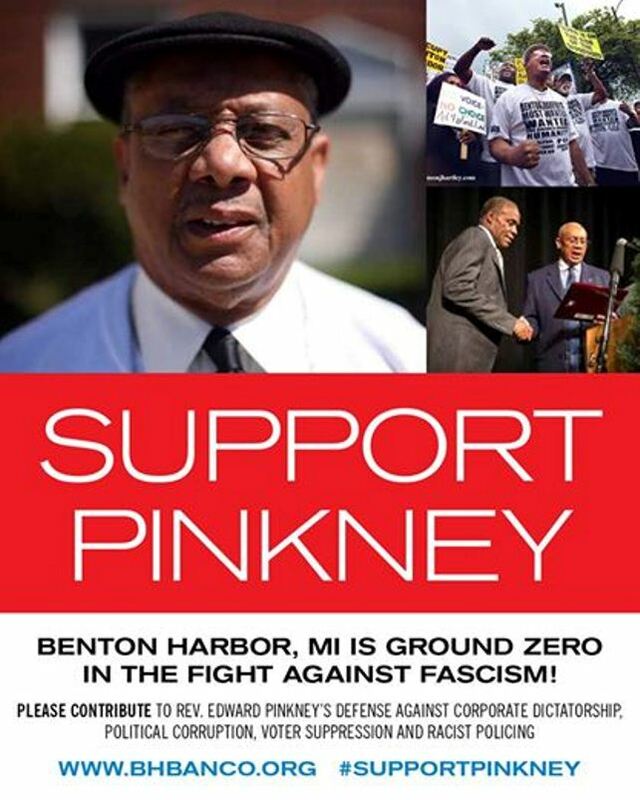 What we need to do now is to get Pinkney and other speakers, especially from Michigan who are in the battle against the Emergency Managers, on radio and television, promoted on social media, and out speaking in communities throughout the country. Breaking the media blackout is urgent. Letters of support sent to banco9342@sbcglobal.net will be posted on the BANCO (Black Autonomy Network of Community Organizations) website. Fundraising for the defense is also critical. The defense is trying to raise an immediate $5000 for the transcript and for an appeal of the Judge’s decision to take this sham case to trial. Money is needed in the next 10 days. Send donations to Banco, 1940 Union St., Benton Harbor, 49022 or make donations at bhbanco.org. For more information on how you can get involved, or to order papers to get out in your community, contact the People’s Tribune at 800-691-6888, email info@peoplestribune.org or visit the website at peoplestribune.org.